Increasingly I've noticed a battle between the old paradigm and the new as inbound marketing becomes increasingly mainstream. Inbound is a different game than traditional marketing, and it requires a different mindset. Traditional marketing, characterized by waterfall planning, had a mass focus by nature. Success was about creating meticulous clarity, researching to assess and confirm hypothesis, and making (relatively) big bets. This was necessary because the traditional marketing model was all about competing and winning in the head of the market, as opposed to the long tail. When going for that part of the market, the risk was much higher because the noise is loud, the cost to play is high and the opportunity to fix mistakes was low. It was kind of like having a Super Bowl ad flop. The new world of marketing is characterized by agile planning. It's about winning the long tail. It requires that you move quickly, willingly experiment in the market, iterate and improve consistently. It's about nothing ever being done, and realizing that your entire go-to-market strategy is always a work in progress. Inbound marketing is a child of this new world. While much has been written about the differences between waterfall and agile approaches, I want to focus on an even more critical difference for success; namely the difference between focusing on the long tail and the head. In some way every marketer dreams of their version of a best seller. After all, we've all been brought up with the idea that success is all about that big hit. That was certainly true of traditional marketing, but it's not true in today's highly fragmented, Zero Moment-of-Truth (ZMOT) world. If lead generation, management and the creation of sales qualified leads are your goal, it's not about having one or two things that everyone is a fan of (that's both an extraordinarily expensive and highly improbable approach), but 50 (or 500) things that a few people really like. 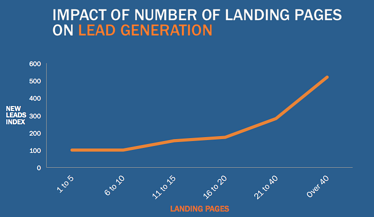 As the chart to the left shows, as you create more landing pages the number of leads you create increases significantly, with virtually no point of diminishing returns. How can this be? After all no point of diminishing returns is akin to violating the law of gravity. The answer is the long tail. In the long tail there are no big winners, but there is tremendous depth. So your white paper or video may only get a few people to respond, but the bigger issue isn't how many respond, but who are they, and how engaged were they? Segment your database, and segment it again. The next step in focusing is to map your content – all of your content – to each of your personas and along their journey. For example, if you have three primary personas you are trying to influence, and you know that there are four phases of the journey they go through, you need to create a three by four grid to map your existing and potential content. Each stage of their buying journey. The questions each persona is asking themselves (for each stage). The milestone action that would indicate they’ve advanced in their journey. Which of your web pages is geared to each persona at each phase. How each piece of premium content falls along the path. Which CTA’s are geared to each persona and stage. As you create content you’ll find that much of it addresses more than one persona and more than one phase of the journey. That does not mean that one size fits all. You’ll want to consider repositioning a piece of content, adjusting the landing page or calls-to-action, or even the piece itself to appeal directly to your content map. Much has been written about all the noise in the market. You only have two choices to break the noise barrier: sponsor the Super Bowl halftime show or microfocus your content (and I mean both your online and offline content) to specific segments at specific stages. The mantra of long tail marketing is always be experimenting. Try different things. Play with content length. Use multiple channels. Even try different tones. Success isn’t about getting the initiative to 100% (that’s the old, mass media approach). It’s about getting it to 80%, getting it done fast, keeping what works and throwing out what doesn’t. One reason that HubSpot has been such a tremendous success story is that they’ve been experimenting from the day they started, and even now that they’re a public company they continue to test where it counts – in the market. I have a friend and client who has completed multiple triathlons, done the Tour De France course all while running a highly successful business. I asked him how he does it and he told me that he runs his life like he trains. He calls it the “Interval Lifestyle.” Being agile is all about interval training. Run a sprint. Focus on getting a few things out. Then learn, adjust and start over again. There will always be the pull to the mass (it’s called reversion to the mean, or average). Resist that at all costs. As the great philosopher Taylor Swift says, “Haters are gonna hate.” You’ll hear from the people who don’t like something before you hear from the people that matter. This is why focus and tracking are so important. Watch the numbers. Keep your focus on progress – not perfection, and very soon you’ll see the momentum build. Jim Collins refers to it as the “fly-wheel effect.” Soon (and by soon I mean typically 9 – 16 months) you’ll find that virtually every “little” thing you do is having a big effect. That’s when growth becomes effortless, and predictable.